This fragment was once the right front of a jacket, belonging to a child. It was found in a tomb at El A'zam, near Asyut, in Upper Egypt. 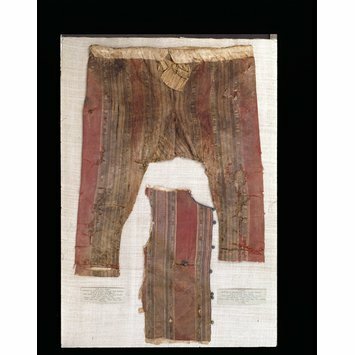 The garment is made of silk cloth woven in colours on a red ground with vertical stripes, and lined with undyed plain woven cotton cloth. The neckline and front edge is bound with plain woven blue silk and seven blue knotted textile buttons have survived down the front . The small chest pocket with button and loop closure have been neatly stitched down, which might suggest professional production - or a skillful amateur. A pair of trousers in the same material would have completed the outfit. 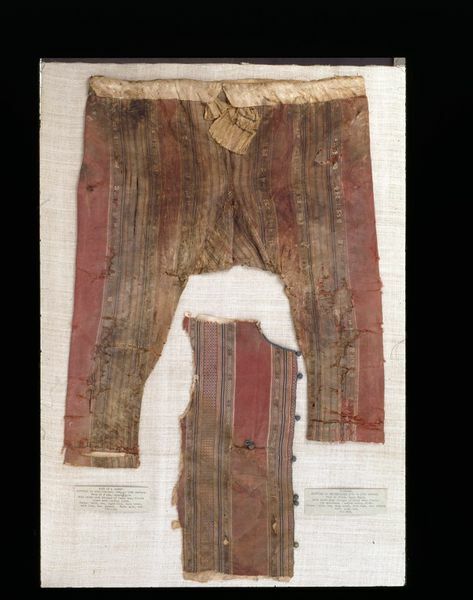 Several textiles and complete garments from this burial ground, near Asyut, are in the collection of the V&A. The proper right hand side of the front of a jacket for a child. It is made of silk cloth woven in colours on a red ground with vertical stripes of fancy warp floats, some filled with small diaper patterns. It is lined with plain woven undyed cotton cloth and bound around neckline and front opening with blue plain woven silk. Seven knotted round buttons along the front, of which two around waist level placed close to each other. A little pocket, neatly stitched, at chest level, closure with knotted round button and loop. This part of a jacket was purchased from H. Wallis Esq., together with a variety of objects (Chinese and Western) with museum numbers 753 to 819-1883, for £100. The design of the silk is same as fabric of 1142-1900. Most of the Egyptian material from this purchase, as this jacket fragment, came from a tomb at El Azam, near Asyut, Upper Egypt.